If you own only one disc, this is it. 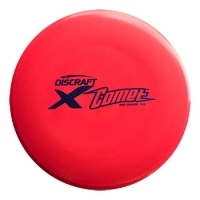 The legendary Comet™ is a super accurate, straight flying approach disc. Holds whatever line you throw it on. The Comet™ was crucial to Ron Russell's Pro Worlds victory, and has been called the best golf disc ever. Notable: Perhaps the best disc ever made. Super accurate from any distance. This Product was added to our catalogue on Friday, 24. August 2007.